He is known for his mythological trysts and his ideas of religion are very clear. 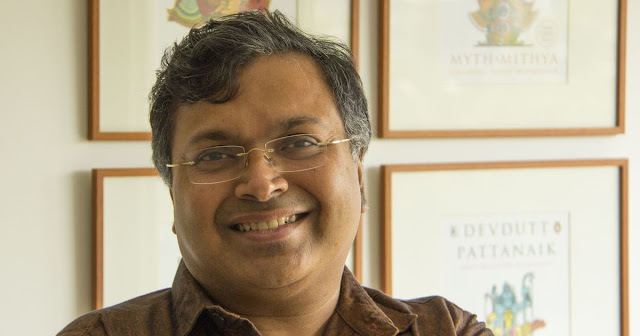 Devdutt Pattanaik, feels if you don’t have mythology, you are an animal. “Only humans have mythology in their life, if you don't have mythology you are an animal, where there is language, there is mythology, where you can communicate point of view. The beginning of mythology is what happens after death, scientists can tell how things happen but can't tell you why it happens, this is why people come to mythologists to get answers of these question. When asked about truth, he said that the truth changes accordingly, like you grow truth changes for you,” he said during a talk session in GIFLIF held in Bhopal, Madhya Pradesh. "The technical definition of Mythology is subjective truth of people communicating through stories symbols and rituals. And the way they see the world and this world has not born yesterday it's transmitted over generations through katha stories rituals and symbols this three things have to be there in order help to communicate how people saw the world this what mythology is" Devdutt added. Talking of Bheem Baithika he said, “This is the place of art, why would someone make art after satisfying his hunger, why would someone paint animals after eating them, it’s because the brain is developing and you want express your experience or you are educating your children that these are animals or you see them in your dreams. You see a lot of images of farming, people dancing like they had a world view about life and cremating someone's dead body like they knew that there is an another world after life. Bheem Baithika is the first evidence of the civilization in India that lived according to some scientists hundred thousand years before Harappa and Indus. It's the unusual place in world where you will see hunter gatherers and stories of about some ages before which are about farming, dance, poetries, death and its name is all because of faith of people. The tribal people still communicate through their stories and all these rituals and traditions come from the tribal people to educated people and we present it in a different manner because we can write and package it better but they are living that same in everyday life. They have their different values and traditions but we cannot say that they are better or we are better because we are living in urban area and have technology. He says, when I talk about Raja Bhoj it always reminds me of the stories of "Sihasan Battisi" and King Vikramaditya. In which there were 32 statues on the throne which symbolized each value that a king must have been. He has written 40 books till date. About 20 years ago he passed medicine and is working in pharmacy but this has always been my hobby things that we do on weekends just for pleasure, I always used to do storytelling of religious stories in my school days like of Amar Chitrakatha and Chanda Mama. I used to make pocket money by writing freelance columns magazines and the editor my articles of culture and tell me to keep writing. They said why don't you write more on this and somebody said that you should write a book. As i am not a literature student I used write in columns and without any comma, full stop then the editor said that you should work on your writing and make full sentences and learn on grammar but now I know that it was important and i learnt that and wrote a book on Shiva and it got completed very soon and the editor was shocked on my speed of writing it because I wrote it methodically as I was a science student and used to apply the same while writing my books. My books look like a science text book as it has diagrams, notes, text and notes with bullet points. I write for the pleasure of the audience so you have to be clear about how they read. It's a work of art. Ramayana's story is small but the idea is refined and in Mahabharata story is widely big but the idea is minute. So understanding Ramayana is difficult but we think that Mahabharata is difficult to understand but it isn't. The illustrations are to say what words can't convey and for that I sit myself with the designer to create illustrations that go with the books. When he writes books he does a well research in which he reads encyclopaedias, books different books and talk with the scholars for the information and translated Puranas and poems of different languages. And he says that youngster also wants to read and has hunger for the immense knowledge but does of have any access to the knowledge of their food. He has very deep knowledge about everything related to mythology, his interesting way of conversing engaged the audience with him and after this talk session he also answered the questions from the audience and autographed books for his fans.